Why didn't NATO object to the Greek acquisition of the Russian S-300 missile system? However, my feel is that the S-300 has been compromised. Here is another article that is very interesting. So, just having the S-300 is not sufficient? There is no FMS notification for Greece. Depending upon the time frame being considered (likely late 2020's/ early 2030s) it may or may not be raised but there is certainly a possibility that someone in the process raises that as a point of concern. Also the nature of the acquisition and future plans are different. Greece essentially got passed the S-300 as a compromise to bring to rest an escalation between Turkey and Cyprus. They aren't acquiring strategic air-defense systems from Russia with the aim of integrating them on a common network and IADS system that will also have the F-35 integrated into it. By the time Greece ends up fielding the F-35A their S-300 acquisition would have been more than 2-3 decades old so very much a legacy system. Big difference from the Turkey situation. Greece is not a partner on the JSF program. 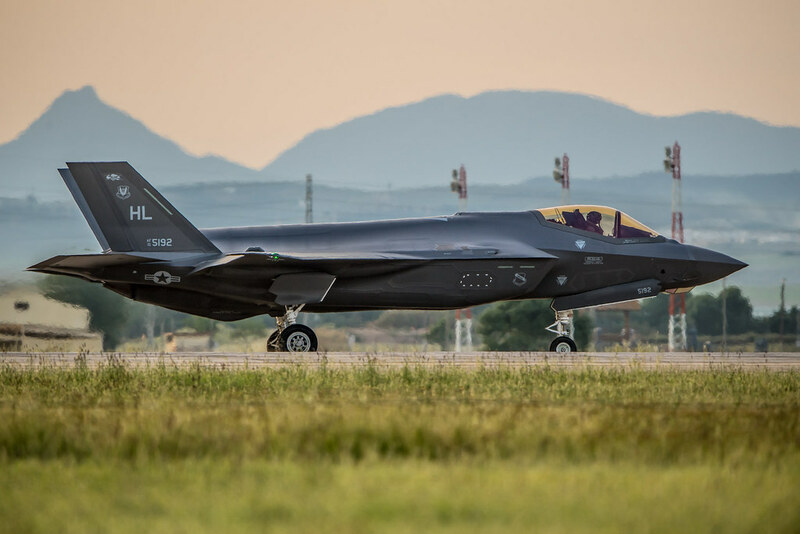 A formal request for F-35A's for Greece would be evaluated just as any other FMS case is evaluated. Turkey being a program partner does not need to go through the FMS process and it is certainly prudent from the US perspective to re-evaluate that relationship and see if Turkey really needs to be a part of both the industrial program (with its industry set to make Billions from the JSF program over the next several decades just as it has with the F-16 program) and as an operator. Last edited by brar_w on 16 Apr 2019 07:23, edited 4 times in total. Last edited by brar_w on 16 Apr 2019 18:10, edited 3 times in total. Bell pushed its V-280 Valor tiltrotor to 300kt (556km/h) in a March test flight, surpassing its previous top speed for which it is named, 280kt. Believing that it has sufficiently proven the rotorcraft’s high-speed performance, the aircraft manufacturer will spend the coming months testing its low-speed manoeuvrability. Lockheed Martin's Pilotage Distributed Aperture Sensor (PDAS) system also flew for the first time aboard the V-280 in March. Bell recently completed some initial tests on the tiltrotor’s ability to facilitate fast-roping deployment of troops. No personnel slid down a rope that was dangled from the side door of the aircraft, though Bell says the fact that the line remained stable during a low hover, and did not get blown around in the downwash, reassured the company that the descent is possible. Bell believes the rotorcraft’s ability to disembark troops is one of its advantages. “When you’ve got two giant side doors, 1.8m (6ft) wide …. [on] both sides, you can see everybody is within two steps of getting out of the aircraft and getting to a fast rope, and getting out on the ground to execute the mission,” says Ehinger. Bell has flown the V-280 for more than 100 flight hours and has put 200 operational hours on the aircraft in total, including ground and taxing tests. That can be one potential use. However, Electronic Warfare gear is usually deployed separately into a theater irrespective of the AD footprint committed to the region. The ALPS sensor is very much part of the Air Defense units there and will contribute to defeating of the threats mentioned in the article. As the article states this appears to be a passive system that comes with a weapons threat library and helps AD units better ID cruise missiles and UAS at longer ranges. There are supplemental USMC requirements are probably even more favorable to the V-280 given that the Marines are looking at a cruise speed closer to 300 knots..
Just as I suspected. The SB>1 is going to need mods to meet the USMC cruise speed requirements which is in excess of 270 knots as a threshold and closer to 305 knots as an objective. The V-280 TD has already flown at 300 knots. NASHVILLE, Tennessee—The Sikorsky/Boeing team must modify the SB-1 Defiant to achieve the Marine Corps’ goal of 270 kt. for the Future Long-Range Assault Aircraft (FLRAA) that will replace the Bell UH-1Y Venom fleet, industry officials say. The government must trade how large of an aircraft it needs to balance power versus function, Kenneth Eland, future vertical lift program manager at Boeing, told reporters April 15 at the Quad-A Army aviation conference here. For example, for the SB-1 to achieve 270 kt., it will need a large engine and transmission. The Marines could choose to shrink cabin space and carry fewer people to accommodate a larger engine, Randy Rotte, cargo helicopter and future vertical lift business development director at Boeing, said during the same April 15 briefing. “It goes back to informing those good trades that the customer, the [Defense Department], will have to make to achieve what’s most important to them,” Rotte said. Separately, the Defiant will fly its third flight next week when it will try to perform frequency sweeps and check the structural modes of the aircraft. The active vibration control will also be powered for the first time during the same flight, Bill Fell, experimental test pilot at Sikorsky, said during the same April 15 briefing. The Defiant completed its first flight March 21 at West Palm Beach, Florida. The high-speed helicopter is built for the Army’s joint multirole technology demonstration, which is the precursor for the FLRAA to replace the UH-60. The first flight was delayed because of production challenges and a second delay occurred because of problems with the powertrain system testbed. The Army, Marines and U.S. Special Operations Command are on track to complete an analysis of alternatives for the FLRAA later this year. Bell anticipates its V-280 Valor will fly autonomously by the end of the calendar year and is in negotiations with the U.S. Army for more funding to continue envelope expansion, trades and sensitivity analysis, a company executive says. The Army would like for Bell to conduct more operational maneuvers, such as going to an alternate landing zone at a high rate of speed, Keith Flail, vice president of advanced tiltrotor systems at Bell, told Aerospace DAILY here April 16 at the Quad-A Army aviation conference. The Army issued a request for proposals to Bell for the potential work, and Flail said the conversation is ongoing. Separately, Flail’s team is preparing for the V-280’s first autonomous flight. “We’ll have a safety pilot onboard but basically take off on its own, fly around, come back and land on its own,” he said. The V-280 has surpassed 300 kt. of airspeed, 200 operational rotor-turn hours, both unrestrained and restrained, and 100 flight hours of envelope expansion to date, Flail said. The Valor is one of two aircraft built for the Joint Multi Role program, which is the precursor to the Future Long-Range Assault Aircraft (FLRAA). The Army has released a request for information for the effort and gave vendors one week to respond. Flail is confident his team can “absolutely” meet the Army’s $43 million cost target. FLRAA is intended to replace the Army’s Sikorsky UH-60 Black Hawk and the Marine Corps’ Bell UH-1Y Venom. Developed by Lockheed Martin’s Skunk Works, a thermoplastic nanocomposite that rivals aluminum in performance, but at a lower weight, is to be commercialized by a new startup. Alpine Advanced Materials has been formed by venture development company Catalyze Dallas, which previously created Metro Aerospace to commercialize a drag-reducing technology developed within Lockheed. The new material, called HX5, has 90% of the strength of 6061 aluminum, but only 50% of its density. The material solves two of the biggest issues of 6061 aluminum, Alpine says: weight and the galvanic corrosion that occurs when aluminum is in contact with carbon-fiber composites. More than $50 million was spent over eight years developing the material within Lockheed, the startup says, and HX5 has been approved for use on the F-35 Joint Strike Fighter, the S-97 Raider rotorcraft developed by Lockheed-owned Sikorsky, and satellites. The nano-reinforced thermoplastic material can replace aerospace-grade aluminum without loss of mechanical performance, Alpine says, and is resistant to solvents, fuels and lubricants, high temperatures and radiation in space as well as galvanic corrosion. The material can be machined like aluminum without chipping, cracking, galling or gumming, and holes can be tapped and treaded as in metal. Parts produced so far include an electronics enclosure for the S-97, missile brackets and bulkheads and the structure for a gunner’s chair. Alpine has been formed to design and manufacture high-performance components for aerospace and other industries using the new material. Target applications include clips and brackets, electronics enclosures and racks, seats and galleys, and hardware for avionics and inflight entertainment systems. Catalyze Dallas’ earlier venture, Metro Aerospace, is marketing and producing Microvanes, aerodynamic devices developed within Lockheed to reduce the drag on the upswept aft fuselage of the C-130 airlifter. Metro has sold Microvanes to several C-130 operators and is offering a version for the Boeing C-17. ^^ Brar sir, noob pooch. How is this HX5 material different than what DRDO is developing as structural (nano)composites to be used in fuselage structure? or is it just Khan style marketing? souravB wrote: ^^ Brar sir, noob pooch. How is this HX5 material different than what DRDO is developing as structural (nano)composites to be used in fuselage structure? or is it just Khan style marketing? That would depend upon their respective properties and what application they are approved or being sold for. ie Greek S300's are actually Cypriot. The EMD effort – awarded o 7 March and scheduled for completion by December 2023 – includes the design, integration, and test of a new solid rocket motor for the AARGM-ER for use on the US Navy’s (USN’s) F/A-18E/F Super Hornet, EA-18G Growler, and F-35A conventional take-off and landing (CTOL) and F-35C carrier variant platforms. AARGM-ER could potentially equip the US Air Force (USAF) F-35A, which has the same bay dimensions as the F-35C. Northrop Grumman’s AARGM-ER design introduces a new aft actuator control system – designed by Northrop Grumman Missile Systems – with the mid-body wings on the legacy AARGM removed. This not only enables a form fit capability internal to the F-35 but also improves manoeuvrability and reduces drag. The company has introduced side-body strakes that deliver lift during the missile’s flight. To assist the required range increment, the existing mid-body control section componentry is repackaged to deliver additional space for propulsion, while the airframe is tapered up from aft of the seeker section to deliver an approximate 10% increase in diameter, with consequent additional volume for propulsion. A new solid propellant rocket motor for the AARGM-ER will be designed and integrated by Northrop Grumman Missile Systems. Northrop Grumman is also developing a new warhead solution for the new missile based on its Lethality Enhanced Ordnance (LEO) scalable fragmentation/penetration warhead technology. The LEO solution uses a thinned out shell casing supplemented with an inner fragmentation layer that can be scaled according to the required target set. 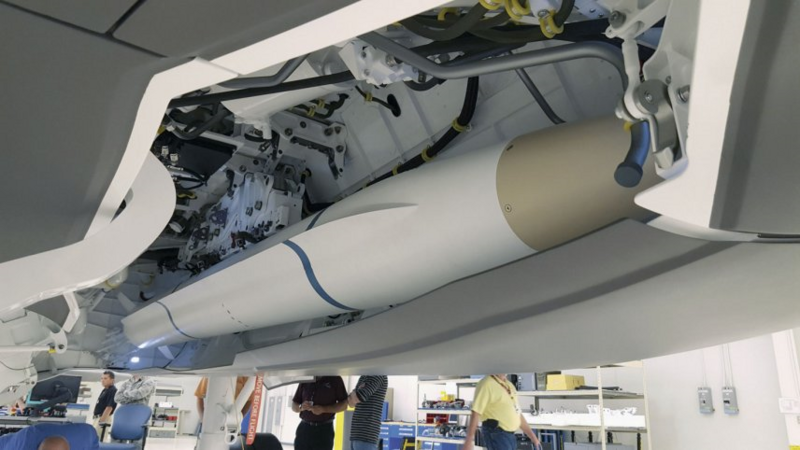 “LEO is a fairly generic technology: PBXN-110 explosive fill and fragmentation layer; it’s how we array those fragments that determines the desired effects,” Pat Nolan, vice-president and general manager, Missile Products, Northrop Grumman, told Jane’s . “In partnership with the AARGM-ER program, SiAW will enter the EMD phase of the acquisition cycle and focus on detailed design, test, integrations, and production activities of SiAW. The Department of Navy (DoN) will be the lead for development and the United States Air Force (USAF) will be the lead for F-35 Integration. The relationship between the DoN and USAF will be defined in three separate Memorandums of Agreement (MOA): Requirements MOA, Program Office MOA, and Service Acquisition Executive MOA,” the document added. Northrop Grumman is also pursuing the development of a surface-launched stand-off derivative of the AGM-88E Block 1 variant AARGM to address, in the first instance, US Army long-range precision fire requirements. The surface-launched AARGM (SLAARGM) concept provides for a spiral development of the AGM-88E Block 1 as a high technical readiness level stand-off supersonic, surface-to-surface strike weapon to engage land and maritime targets in complex A2/AD environments, through GPS/INS point-to-point or point-to-millimeter wave (MMW)-terminal guidance. The company’s SLAARGM concept envisages utilisation of up to a nine-cell launcher developed by Northrop Grumman Marine Systems for application in both land- and maritime-based roles, with the SLAARGM effector supplied in a hermetically-sealed canister. This concept provides for an additional system element with a dedicated SLAARGM fire control system/C4I capability. While the SLAARGM derivative will be evolved from the baseline AGM-88E Block 1 AARGM, a company spokesperson told Jane’s that the potential future growth path for the surface-launched weapon includes leveraging the developmental AARGM-ER.